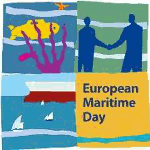 European Maritime Day (EMD) is an annual observance held on May 20. It focuses on raising awareness of the seas of Europe and their importance. European Maritime Day was instituted jointly by the European Parliament, European Council and European Commission in 2008. It was part of the European Union maritime policy aimed at rising the visibility of the maritime sectors and supporting an integrated approach to maritime affairs. The main event of the day is the EMD Conference. Each year, it is held in a different city. The first conference took place in Brussels, Belgium. The following conferences were held in Rome (Italy), Gijón (Spain), Gdansk (Poland), Gothenburg (Sweden), Valletta (Malta), Bremen (Germany), Piraeus (Greece). The conference is attended by policymakers, maritime industry professionals, leading representatives of maritime organizations, environmental activists, scientists, educators. Every year, a new maritime issue is highlighted. The European Maritime Day Conference is not the only event held on the occasion. Various events and activities are organized in port cities throughout Europe. They include (but are not limited to) workshops, discussions, exhibitions, public happenings.